As I said in the first post photos taken in Vitaleta, the chapel in the heart of Val d’Orcia – Tuscany, to reach the appointed place I had to do quite a long walk in the middle of the campaign, because a gate prevented the passage of the vehicles. 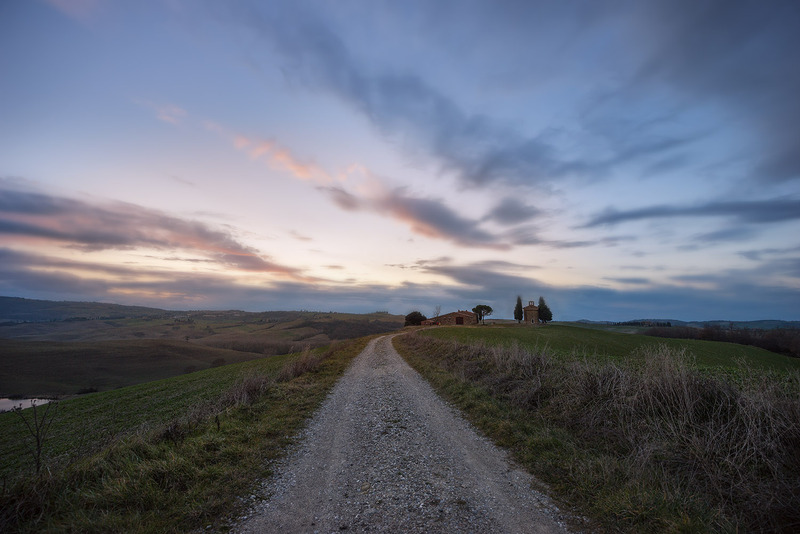 This is part of the road that I have walked to reach the place, this also in the countryside and in the colors of the sunset, on the right in the distance you can see the chapel of Vitaleta that I photographed up close in my two previous posts. The image is nothing more than a long exposure taken at the end of my stage of shooting while I was returning to the car, it consists of a exposure taken for the”land” and a shot for the most overexposed sky, put together and edited entirely in Photoshop CC.